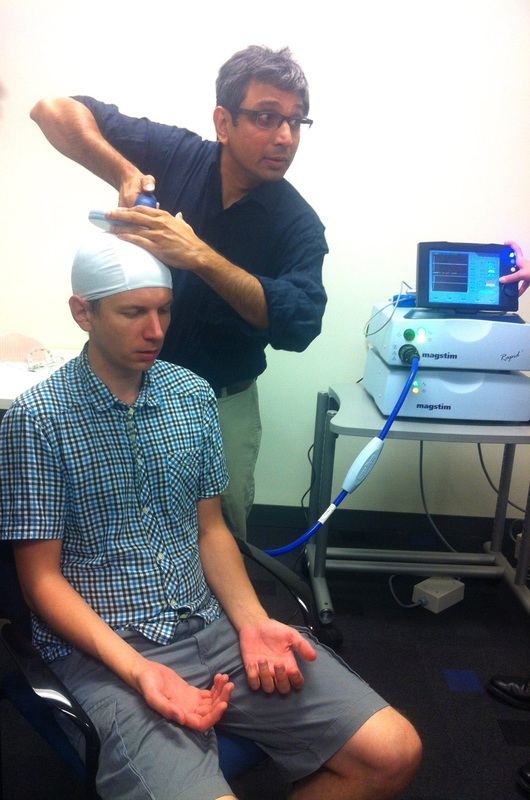 A TMS trial: With Dr. Balasubramaniam and Bodo Winter (PhD student in CIS). pic courtesy: Maryam Tabatabeian. Dr. Ramesh Balasubramaniam is a Professor of Cognitive & Information Sciences at the University of California, Merced. Our laboratory is engaged in fundamental work on Cognitive, Neurophysiological and Dynamical systems approaches to human action. We use the study of human motor control as a vehicle to understand the embodied nature of cognition. We use 3-D motion capture, eye tracking, robotic manipulanda, TMS, EEG and other electrophysiological recordings to study the brain and behavior. Our research is supported by several grants from the National Science Foundation, Office of the President of the University of California and the Blum Center. Please click on the various links above to learn more about the work going on in our laboratory, the people engaged in this research and our various projects & publications. 7) Complexity and adaptability in the human sensorimotor system.